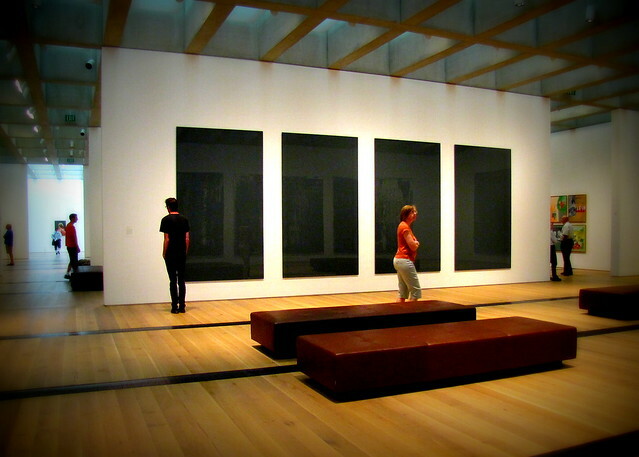 The four black plexi rectangles are Art, with a capital A.
I know this is Art with a capital A because it’s in a Museum, bold and in italics. I had eight framed photographic prints in a local store for the last year, They are 8″x10″ prints, matted and framed and, I believe, reasonably priced at $30 each. The subjects are landscapes and florals, meant to go with almost every decor, and appeal to the customers of the venue, a metaphysical shoppe. Out of eight framed prints, one has sold in the last year. So the question remains: Qu’est-ce que l’art? The admirable MzSusanB visits an Art Musueum. Art is anything ugly, profane or impossible for the “average” person to understand as long as it’s in a gallery or museum 🙂 It must jolt the viewer out of his pleasant afternoon daydreams and remind him that the world is awful and hopeless.